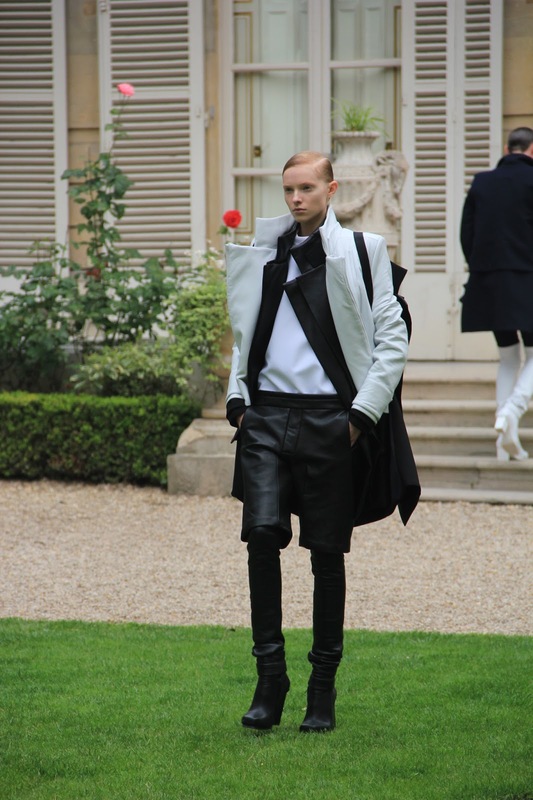 The ONLY one couturier who's doing unisex collection, Rad Hourani, today showed his couture creation at the beautiful garden at the residence of the Canadian Ambassador to France in rue du Fauburg Saint-Honore. IT WAS AMAZING. Last red-rose standing. This bloom has its own story along the show. And below is my favourite look of the collection. The multi-layered black and white leather jacket with above-knee black leather short, tight leather trousers, and paired with ankle boots from the same material. It looks like an armour, with geometric structure and symmetrical form, and black-and-white colour makes it looks even more stronger. During Paris couture week, when every runway is filled with feathers and sequins in every possible colour with meticulous and sumptuous flamboyant silhouette, Rad Hourani offers a no less complex unisex collection. His interest in math and architecture combined with impeccable taste of art (he's really good at math at school. Read my interview on the next post a bit later ^_^ ) is a very fundamental base for his collection. He created transformable pieces—open it and you have a jacket, then zip it to have a corset without loosing structure, with strong cut and bold old colour of black and white ("Black is old colour", he says) with a bit upgrade from the next season by putting navy-blue in some looks. It's such a sophisticated version of couture.